A trusted partner to accompany you in your project, your success is our commitment! For 35 years, the team of Agence Immobilière A.-E. SCHMID SA has specialized in brokering, development and real estate development in Geneva. Our multilingual staff is by your side to help define and achieve your goals. These dynamic and passionate professionals are continuously trained to stay responsive and up-to-date in a fast changing market. Our perfect knowledge of the market, combined with a capacity for expertise and evaluation allows us to move towards your interests and set up your mandates as soon as possible, at the fairest price. Research, expertise, valuation or financing advice; the team dedicated to brokerage is committed to guiding you through all the steps related to purchase or sale. Perfectly located in the heart of the Malagnou district, our new arcade Avenue Krieg is a refined setting designed to best welcome you. See you soon at Agence Immobilière A.-E. SCHMID SA. Spoken languages : french, english. Alexandre has solid experience in real estate brokerage, promotion and management. For more than fifteen years, he has been striving to develop and structure the company. 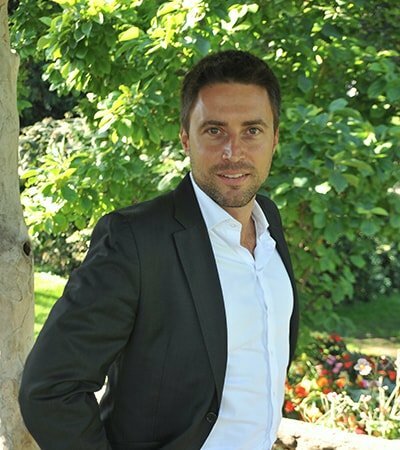 His ethical values ​​and his dedication allowed him to make the real estate agency, a key player in the Geneva market. In addition to his duties as manager and director, he continues to work on the field. Thierry benefits from his 15-year customer service experience in the automotive sector. In 2010, he decided to switch to the exciting field of real estate and obtained the broker's degree from the USPI (Swiss Association of Real Estate Professionals). Spoken languages : french, german, english. Following his studies, the call of duty led Fabrice to become a sergeant in the Swiss army. This enriching experience taught him a lot and it was in 2014 that he joined the A.-E. Schmid. From then on, he made sure to be rigorous and precise to obtain full efficiency, quick response and availability for his clients. Fully dedicated to his task, Fabrice never stops until the goal is successfully achieved. Spoken languages : french, english, italian, spanish. Gregory has a decade of experience in finance and several years as a real estate agent, which allows him to be responsive both in real estate and financial. He has, over time, been able to create a large network in the Lake Geneva area. His many travels expanded his knowledge of foreign languages ​​to the point that he is fluent in four. Creative and dynamic, Gregory will find the solution to all your requests and will make sure to find the property of your dreams. After completing his studies at the IFM University of Geneva with a Bachelor in "Business Administration" with a specialization called "International Business", Hubert was interested in the world of real estate for the tangible and relational. Through his professional experience, including one in Mozambique in the cotton industry, he has developed his ability to adapt to his environment. In 2018, he began his collaboration with A.-E Schmid and will know, by his ability to listen, his motivation and availability, perfectly meet your expectations. Graduate in computer science and after more than 10 years spent in the world of new technologies and information, in the banking sector, then in Haute Horlogerie, Pascal decided to reorient himself in the world of real estate, this domain having always been passionate. After a first experience as a manager of a portfolio of properties for rent, he joined in 2019 real estate agency A.-E. SCHMID SA. Thanks to his relational ease, his motivation and his strong desire to satisfy every customer, he will be at your disposal to best meet your expectations. Céline is keen on traveling and graduated in the tourism sector, after which she began her professional life in the business area. In 2013, she discovered the captivating world of real estate in which she started as a broker. Thanks to her diversified career, she has developed a great versatility and sense of organization. A great listener, Céline will know how to best respond to your solicitations. Sarah began her career in real estate and then continued on to advise clients in the finance industry for more than four years. Wishing to return to her first vocation, she joined the team as a sales assistant. Very attentive and customer-oriented, Sarah will provide quality service. Isabelle has received excellent training at the business school and at the prestigious Hotel school. She has also had extensive fiduciary experiences for several decades, dealing in particular with several mandates for different companies. With a perfect understanding of how a company operates in accounting, she brings to the real estate agency her valuable knowledge and skills since 2016. With 18 years of international experience in interior architecture in the cities of Paris and Beijing, Lang joined our team in 2018. Graduated of the prestigious Parisian school Camondo in 2009, she brings to the real estate agency its innumerable skills in the realization of projects, visuals, as well as the accompaniment of the customers.